Select a Country.. Afghanistan Albania Algeria American Samoa Andorra Angola Anguilla Antarctica Antigua Argentina Armenia Aruba Australia Austria Azerbaijan Bahamas Bahrain Bangladesh Barbados Belarus Belgium Belize Benin Bermuda Bhutan Bolivia Bosnia Botswana Bouvet Island Brazil Brunei Darussalam Bulgaria Burkina Faso Burundi Cambodia Cameroon Canada Cape Verde Cayman Islands Central Afr Rep. Chagos Islands Chad Chile China Christmas Island Cocos Islands Colombia Comoros Congo Congo Cook Islands Costa Rica Cote D'ivoire Croatia Cuba Cyprus Czech Republic Denmark Djibouti Dominica Dominican Republic Ecuador Egypt El Salvador Equatorial Guinea Eritrea Estonia Ethiopia Falkland Islands Faroe Islands Fiji Finland France French Guiana French Polynesia Gabon Gambia Georgia Germany Ghana Gibraltar Greece Greenland Grenada Guadeloupe Guam Guatemala Guinea Guinea-bissau Guyana Haiti Heard Island Holy See Honduras Hong Kong Hungary Iceland India Indonesia Iran Iraq Ireland Israel Italy Jamaica Japan Jordan Kazakhstan Kenya Kiribati Korea Korea,Republic Kuwait Kyrgyzstan Latvia Laos PDR Lebanon Lesotho Liberia Libyan Jamahiriya Liechtenstein Lithuania Luxembourg Macao Macedonia Madagascar Malawi Malaysia Maldives Mali Malta Marshall Islands Mariana Islands Martinique Mauritania Mauritius Mayotte Mexico Micronesia Moldova Monaco Mongolia Montserrat Morocco Mozambique Myanmar Namibia Nauru Nepal Netherlands Nether- Antilles New Caledonia New Zealand Nicaragua Niger Nigeria Niue Norfolk Island Norway Oman Pakistan Palau Panama Papua New Guinea Paraguay Peru Philippines Pitcairn Poland Portugal Puerto Rico Qatar Reunion Romania Russia Rwanda Saint Helena Saint Kitts & Nevis Saint Lucia Saint Pierre & Miquelon Saint Vincent Samoa San Marino Sao Tome & Principe Saudi Arabia Senegal Serbia Seychelles Sierra Leone Singapore Slovakia Slovenia Solomon Islands Somalia South Africa South Georgia Spain Sri Lanka Sudan Suriname Svalbard Swaziland Sweden Switzerland Syria Taiwan Tajikistan Tanzania Thailand Timor-leste Togo Tokelau Tonga Trinidad Tunisia Turkey Turkmenistan Turks Tuvalu Uganda Ukraine United Arab Emirates United Kingdom USA Uruguay Uzbekistan Vanuatu Venezuela Viet Nam Virgin Islands, U.S. Wallis and Futuna Western Sahara Yemen Yougoslavia Zambia Zimbabwe Please select Your Country.Please select Your Country. General surgery is the treatment of injury, eformity, and disease using operative procedures. General surgery is frequently performed to alleviate suffering when a cure is unlikely through medication alone. It can be used for such routine procedures performed in a physician's office, as vasectomy, or for more complicated operations requiring a medical team in a hospital setting, such as laparoscopic cholecystectomy (removal of the gallbladder). Areas of the body treated by general surgery include the stomach, liver, intestines, appendix, breasts, thyroid gland, salivary glands, some arteries and veins, and the skin. The brain, heart, lungs, eyes, feet, kidneys, bladder, and reproductive organs, to name only a few, are areas that require specialized surgical repair. New methods and techniques are less invasive than older practices, permitting procedures that were considered impossible in the past. For example, microsurgery has been used in reattaching severed body parts by successfully reconnecting small blood vessels and nerves. Laparoscopic techniques are more efficient, promote more rapid healing, leave smaller scars, and have lower postoperative infection rates. One of the risks involved with general surgery is the potential for postoperative complications. These complications include but are not limited to pneumonia, internal bleeding, and wound infection as well as adverse reactions to anesthesia. 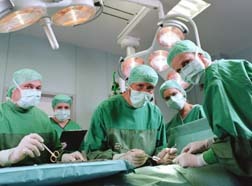 Advances in diagnostic and surgical techniques have greatly increased the success rate of general surgery. Contemporary procedures are less invasive than those practiced a decade or more ago. The results include reduced length of hospital stays, shortened recovery times, decreased postoperative pain, and decreases in the size and extent of surgical incisions. The length of time required for a full recovery varies with the procedure. The Institute for Minimally Invasive and Robotic Surgery at Washington Hospital Healthcare System has developed a comprehensive course of treatment. We believe that you play a key role in your recovery. Our goal and commitment is to involve you in your treatment through each step of the program. Copyright © 2016 www.tour2india4health.com All Rights Reserved.